I participate in a photography group on Facebook where there are weekly themed posts, and I wouldn’t have probably even noticed this image stuck in my archive unless I’d been looking for something to post for the theme “Pier.” And now that I’ve seen this image again, I am not entirely sure why I never posted it to begin with: it evokes many things about that foggy, chilly morning of shooting for a weekend class I was taking. Like the chill. And the fog. And the way I felt very much alone (not necessarily in a good way) for much of the morning. And how, finally, I gave up and went inside for coffee, where I met up with a classmate and we had a chat that’s evolved into a fine friendship. 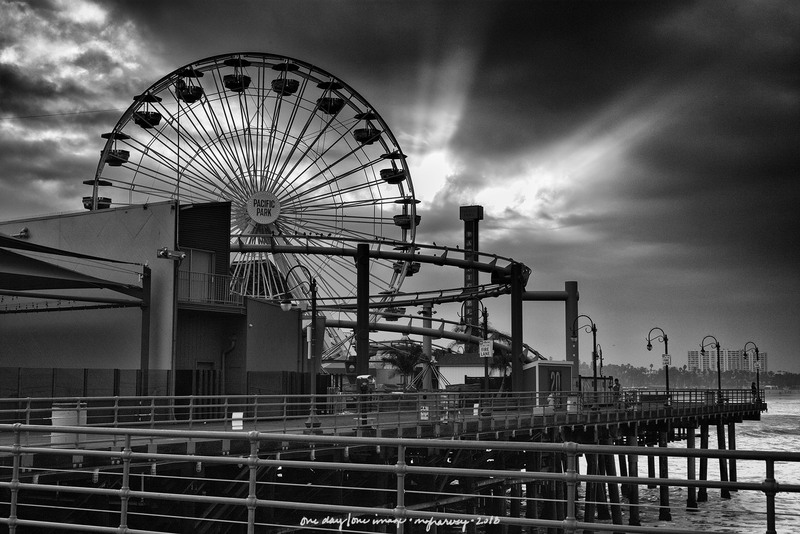 Posted on December 13, 2018, in Photography and tagged 365 photo project, black and white photography, learning to see, Leica, Los Angeles Center for Photography, melinda green harvey, monochrome, one day one image, photography, postaday, Santa Monica California, Santa Monica Pier, thoughtful seeing, travel photography. Bookmark the permalink. 4 Comments. Lots to like here. Even a human ? Good eye – that guy was trying to hide! Thank you, Julie. When I started by blog, I had no idea that making friends was even the most remote possibility.